The plugin can be downloaded by logging into our website using the account that holds the subscription and heading to Downloads >> My Downloads area. The RSMail! - Joomla! Content plugin allows you to import the content of your email messages directly from within your Joomla! articles via a few simple clicks. You can read more on how to install the plugin here. Once the plugin has been installed and enabled, you will notice that within the Placeholders (RSMail! 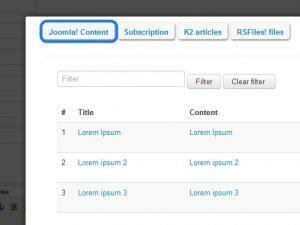 > Messages > New/Edit > Placeholders button (located on the top right corner) area a new option has been added: Joomla! Content. The displayed listing will contain all your articles. 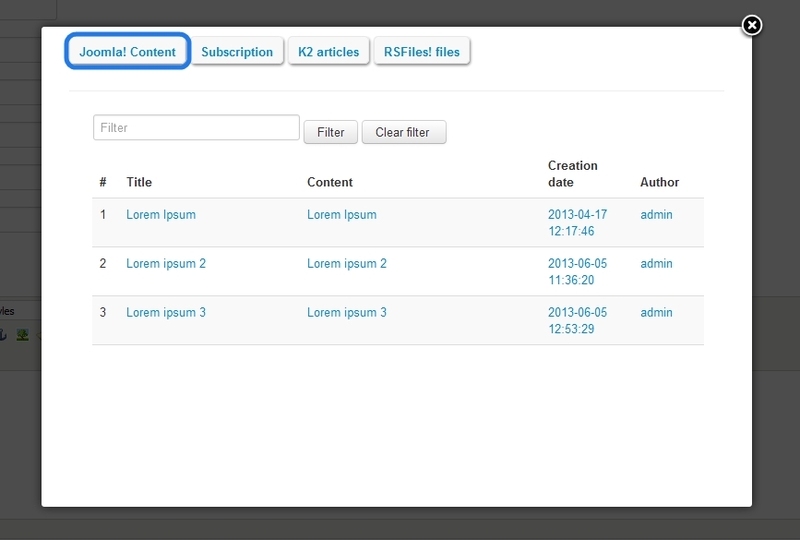 Clicking on a one of the title, content, creation date, author columns will add a specific placeholder within the message body. Once the message will be sent, the placeholder will be replaced with selected content. article: identifies the location of the content. In this case, Joomla! standard articles. text: the portion of the article. In this case, the body of the article.